The days of a gas grill being a throw away outdoor accessory are a thing of the past. Dumping charcoal into a cheap metal bin and dowsing it with lighter fluid just doesn’t make sense when you can enjoy the grilling excellence of a high-quality gas cooking station. The popularity of gas grills has led to new designs that enjoy a wide range of features and functions. Although these bells and whistles can be wonderful, the importance of quality and efficiency cannot be understated. That being said, choosing the unit that best suits your needs can be complicated. Consider these 8 tips when selecting your perfect gas grill. When selecting a gas grill, there are two questions to answer. What type of grilling do you currently do? And, what type of grilling would you like to do? Stainless Side Shelves: These are a must for chefs that that plan to prepare meats and veggies while applying sauces and other complements. Don’t fumble around, get organized with side shelves. Top Shelf Feature: A second-tier shelf allows cooks to warm or grill items away from the flame and at a varied heat. It also grows your overall cooking area. Built-In Options: Outdoor kitchens have been trending over the last decade. Purchasing a grill that has built-in options may be a good feature when thinking ahead. Rotisserie Burner: Some of the top-quality grill-makers provide infrared rotisseries that can add a unique element to your outdoor cooking capabilities. Safety Options: Self-contained lighting systems and one-hour shut-off features provide safety measures that help protect you and your family from injury. Safety is job one. Fuel Source: Grills that provide natural gas and liquid propane options give grill owners the flexibility of using a product’s portability or having it directly fed. Multiple options also allow owners the ability to utilize the least costly fuel source. Saving money matters. Features provide terrific grilling flexibility and increase the potential meals you can complete outdoors. Top grill outfits such as AEI remain far ahead of the curve in terms of exciting features. An AEI PGS product from the company’s A-Series , T-Series and Legacy Grills lines, among others, outpaces many other brands. In terms of grilling creativity, AEI PGS grills are industry leaders. 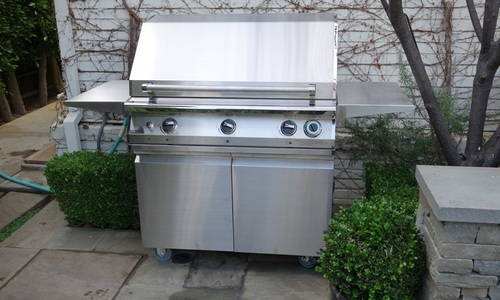 One of the measures of gas grill excellence is the grade of materials used in its construction. When you see that “grill special” at a nearby retailer, in all likelihood it won’t pass the test of time. That’s because it is made from low-quality materials that falter and rust. Grills are general made from cast iron or aluminum, sheet metal, or stainless steel. Although all of these are common, stainless steel ranks as the preferred material. One of the things consumers should be wary of is quality stainless steel grill areas with painted bottoms. Some manufacturers dazzle you with the stainless top while the painted regions cover up lesser quality materials that can rust. If you are going stainless, go all stainless. When consumers think about “performance,” it’s often in the context of how hot a grill gets. That actually has more to do with BTUs. When considering a new gas grill, think in terms of longevity. Many grills market high BTUs, but the failure to utilize only the highest quality parts can result in a marked decline of heat and equal distribution over time. When considering your next grill’s performance, look under the hood and determine whether it is constructed with long-lasting elements inside and out or just shiny with a high BTU rating. This inherent performance problem has led many outdoor grill enthusiasts to purchase AEI PGS grills from both the residential and commercial lines. No one wants uneven heat from a grill they purchased just a year or two ago. Performance is driven by quality materials, design and parts through and through. The idea that a grill is just a utilitarian product and appearance is of secondary importance doesn’t make sense. Homeowners take pride in everything from patios to manicured lawns and gardens. Selecting a good-looking gas grill will add to the outdoor aesthetic you are trying to create with your grounds. Stainless steel models tend to be eye-catching and the envy of friends and neighbors. Black models are well-suited to blend in so that you can accentuate other aspects of your outdoor landscape. When selecting a model consider how height, width, design, detail and material accentuates your overall outdoor vibe. The BTU (British Thermal Unit) rating can be easily understood as the maximum energy output of the burners under your cooking grate. A grill’s rating does not necessarily speak to side burners or rotisserie options. An important thing to be aware of is that certain grill manufacturers try to lump all of these BTUs together and make it appear as if the unit enjoys a higher rating. When considering a BTU rating, be sure it speaks to the energy under the grates and be certain optional cooking areas have a separate BTU rating. AEI’s PGS grills are appropriately rated. Low-quality grills tend to disperse heat unevenly. Anyone who bought a cheap starter grill found out pretty quickly that it was much hotter in some areas than others. As the low-grade product aged, that problem just became worse and you probably had to buy another model. There are two ways to best ensure you don’t go through that again. The first way is to select a grill that has wide flame distribution. Take a look at the lines and look for a high number of flame outlets that are disbursed evenly and often. Of particular interest should be how close they come to the back and sides of the grill. The goal is even distribution side-to-side and front-to-back. The second way to improve heat distribution is to select a grill with high-quality heat stones. These tend to lower flame flare ups from dripping burgers, ribs and other meats. Flare ups sear food unevenly. The vast majority of gas grills purchased at retail outlets have either limited or no warranties. Considering these are a solid investment, that seems fundamentally unfair. Even though AEI PGS grills are made with high-quality, heavy duty materials, they come with lifetime and industry-leading warranties.